Complete Dynamics is designed to be used intuitively, by those who have a professional background in homeopathy. Some features of the program can be used much more effectively if you learn a few tricks. Your computer mouse or track pad can be used to quickly achieve common tasks or call up information. When the mouse cursor changes its shape into a small hand , clicking will perform some action on the item the cursor is on. For example: clicking on a reference will instantly jump to the rubric referred to. In some situations, double clicking can be used to obtain detailed information about the item clicked on. For example: double clicking on a remedy abbreviation in the book will bring up a dialog with detailed information. The scroll wheel is used to quickly move between the rubrics of the book. If your mouse or track pad supports horizontal scrolling, this feature is used for quickly flipping through the book pages. In many situations, popup menus provide quick access to functions. Just right-click and the menu opens (Mac: ctrl-Click). The keyboard can be used to quickly access most common features, highly reducing the need to switch between using mouse and keyboard. You can use the keyboard to quickly navigate through the book, or access menu options via keyboard shortcuts. If you open the menu, you will see the keyboard shortcuts displayed alongside the menu options. For an overview of the keyboard shortcuts, see Keyboard shortcuts. The main modules of Complete Dynamics are accessible through so called index tabs. You activate the module by clicking on the tab, selecting it from the menu (View option), or with a keyboard shortcut. In the Practitioner edition these are Index, Book, Find, Case, Analysis and Materia Medica. The Index module provides quick access to the book's chapters, using both a textual as well as a graphical representation. See help section Index module for details. The Book module shows the Complete Repertory book. You can read it like a printed book, but also view it in a more condensed form. See help section Book module for details. 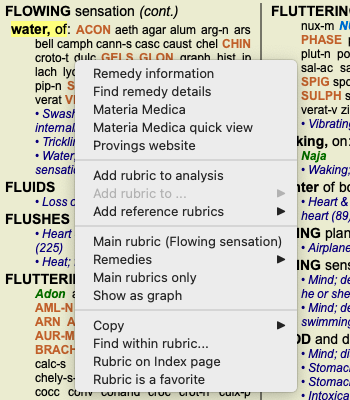 The Find module offers powerful functionality for finding rubrics and remedies in the book. See help section Find module for details. The Case module lets you create and organize your patients case files. See help section Case module for details. The Analysis module is used for analysis of your cases. See help section Analysis module for details. The Materia Medica module gives information about remedies. See help section Materia Medica module for details. At the top of the screen, a button bar provides quick access to commonly used functions. Click on a button to activate the function, move the mouse over it to get a short description of what it does.